This book provides a state–of–the–art review of a major recent technology which has now reached a level of maturity. The editors have pioneered the development and application of these techniques and technologies, and the chapter authors are leading practitioners in their subject areas. The volume encompasses methods and instrumentation across a range of applications. It is directed at researchers and professionals in vibrational spectroscopy, analytical chemistry, materials science, biomedicine, food science and combinatorial chemistry. 1. FOURIER TRANSFORM MID–INFRARED SPECTROSCOPIC IMAGING: MICROSPECTROSCOPY WITH MULTICHANNEL DETECTORS. Rohit Bhargava and Ira W. Levin, Laboratory of Chemical Physics, National Institutes of Health, Bethesda, Maryland, USA. 2 NEAR INFRARED SPECTRAL IMAGING WITH FOCAL PLANE ARRAY DETECTORS. E Neil Lewis, Linda H Kidder, Eunah Lee and Kenneth S Haber, Spectral Dimensions Inc, Olney, Maryland, USA. 3. 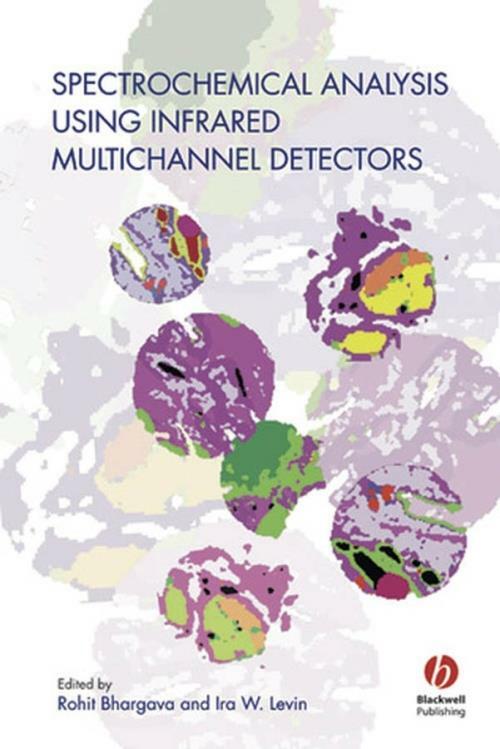 MULTICHANNEL DETECTION WITH A SYNCHROTRON LIGHT SOURCE: DESIGN AND POTENTIAL. G L Carr, Brookhaven National Laboratory, Upton, New York, USA and. O Chubar and P Dumas, LURE and Synchrotron SOLEIL, L′Orme des Merisiers, Gif–Sur–Yvette, France. 4. MULTIVARIATE ANALYSIS OF INFRARED SPECTROSCOPIC IMAGE DATA. Scott W Huffman, Laboratory of Chemical Physics, National Institutes of Health, Bethesda, Maryland, USA and Chris W Brown, Department of Chemistry, University of Rhode Island, Kingston, USA. 5. FTIR IMAGING OF MULTICOMPONENT POLYMERS. Jack L Koenig, Department of Macromolecular Science, Case Western Reserve University, Cleveland, Ohio, USA. 6. COMBINATORIAL APPROACHES TO CATALYST DEVELOPMENT WITH MULTICHANNEL DETECTORS. C M Snively, Department of Materials Science and Engineering, University of Delaware, Newark, USA and J Lauterbach, Department of Chemical Engineering, University of Delaware, Newark, USA. 7. MATERIALS ANALYSIS SYSTEMS BASED ON REAL–TIME NEAR–IR SPECTROSCOPIC IMAGING. Martin Kraft, Raimund Leitner and Herwig Mairer, Carinthian Tech Research AG, St. Magdalen, Austria. 8. INDUSTRIAL APPLICATIONS OF NEAR–IR IMAGING. Anthony E Dowrey, Gloria M Story and Curtis Marcott, Procter & Gamble, Cincinnati, Ohio, USA. 9. IR SPECTROSCOPIC IMAGING: FROM CELLS TO TISSUE. Max Diem, Melissa Romeo, Susie Boydston–White and Christian Matthäus, Department of Chemistry and Biochemistry, City University of New York, USA,. 10. FPA IMAGING AND SPECTROSCOPY FOR MONITORING CHEMICAL CHANGES IN TISSUE. Bayden R Wood and Don McNaughton, School of Chemistry, Monash University, Melbourne, Victoria, Australia. 11. INFRARED MICROSCOPY AND IMAGING OF HARD AND SOFT TISSUES: APPLICATION TO BONE, SKIN AND CARTILAGE. Richard Mendelsohn, Department of Chemistry, Rutgers University, Newark, New Jersey, USA and Adele L Boskey and Nancy Pleshko Camacho, The Hospital for Special Surgery, New York, USA. 12. MID INFRARED IMAGING APPLICATIONS IN AGRICULTURAL AND FOOD SCIENCES. Douglas L Elmore, Carrie A Lendon and Sean A Smith, Cargill Incorporated, Cordova, Tennessee, USA and Chad L Leverette, Department of Chemistry and Physics, University of South Carolina, Aiken, South Carolina, USA. 13. APPLICATION OF NEAR–INFRARED IMAGING FOR MONITORING AGRICULTURAL FOOD AND FEED PRODUCTS. Vincent Baeten and Pierre Dardenne, Centre Wallon de Recherches Agronomiques, Gembloux, Belgium.